Stacy Francis’ passion for helping others through financial planning and investment management is uncommon. She is an award-winning role model for our team, colleagues and women business owners across the country. Stacy regards our clients and staff as family and works hard to ensure that everything runs smoothly. Stacy is a nationally-recognized financial expert who attended the New York University Center for Finance, Law and Taxation, where she completed the Certified Financial Planner™ (CFP®) designation. She comes with over 18 years of experience in the financial industry and is dedicated to her ongoing professional education. Stacy is a Certified Divorce Financial Analyst® (CDFA®) a Divorce Financial Strategist™ as well as a Certified Estate and Trust Specialist (CES™). 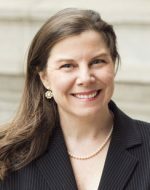 She is the Director of the Association of Divorce Financial Planners’ (ADFP) Greater New York Metro Chapter, the National Association of Personal Financial Advisors (NAPFA) and the Financial Planning Association (FPA). Stacy is one of twenty of the nation’s leading wealth managers on CNBC’s Digital Financial Advisor Council and she frequently appears in media outlets such as CNN, PBS, The Wall Street Journal and USA Today. As much as 10% of all Francis Financial proceeds are donated to charities, including Savvy Ladies™, a nonprofit organization founded by Stacy to educate and empower women to take control of their finances. Savvy Ladies has helped over 12,000 women through free one-on-one financial counseling, workshops and retreats. Stacy grew up in the countryside in Michigan, which sparked her love of animals and the outdoors. She enjoys snowboarding, skiing, and horseback riding with her family. Stacy is as active as it gets and she loves her morning boot camp, running marathons and training for triathlons. Her favorite activities include cooking with her kids for their monthly Chopped Cooking Competitions, discovering new wines with her husband, swimming with dolphins in the Bahamas and scuba diving in the Dominican Republic. Captain Stacy and her family are also avid sailors and she recently acquired her sailing certification.